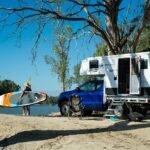 I know plenty of media has already reviewed and praised the Redarc Redvision system, but I’ve been hesitating until I’d used it in a handful of campers and caravans and really got my head around it. I think I finally have. Redvision is the South Oz manufacturer’s flagship control and monitoring product. Well executed, it interfaces with the camper or caravan’s electrical system and allows you to turn up to 10 circuits off or on, individually or as a group, from the one place. More impressively, that place could be your phone, as the unit connects to most smartphones via a dedicated app, turning it into a sophisticated remote control. 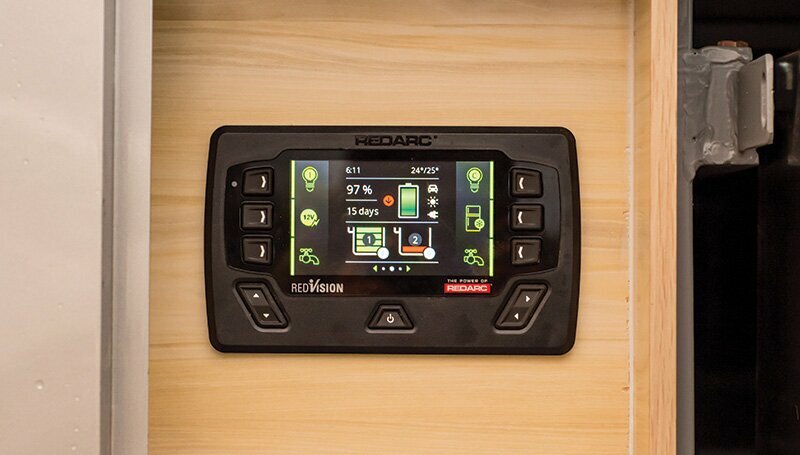 Redvision can also monitor all your camper trailer or caravan’s systems – it has two inputs for temperature, up to six for water tanks, controls a Redarc compatible inverter and when used in conjunction with one of the Redarc Manager products, looks after everything you need to know about the batteries – state of charge, charge input, load and battery condition. Everything gets wired into the central distribution box, which has capacity for five low current appliances (lights and pumps for example) and five high current devices (fridges and compressors), and a dedicated line to an inverter. The concept sounds complicated, but it’s almost plug and play – every manufacturer I’ve spoken to is impressed with how easy it is to fit. Considering Redarc has just announced it’s now available as an aftermarket product (previously it was only available factory fitted to new RVs), that’s a boon for the home handyman. The main display screen is quite simple to use, if you remember it’s not a touch screen. Instead it uses soft-touch keys around the screen and navigation buttons below it. It’s probably better, as you can memorise certain sequences to perform common tasks, rather than deal with an ever-changing screen. Navigation through the functions is also easy – mostly you press a button to turn something on, and again for off. You can adjust the brightness, beeps and how long it stays on after you’ve finished playing with it. I’ve used the phone app less, but it is straightforward, intuitive and convenient. I used it more often for monitoring, rather than switching, but there’s been times when both have been handy. Making sure all the lights are off after a camper’s packed up is one example (so I don’t have to unfold it to check). It’s a high-end product, and especially when used with a Redarc Manager, expensive, there’s no doubt about it. Very few campers probably need something like this, but I can certainly understand the attraction to it. It makes dealing with the campers’ electronics easier, fancier and the monitoring is awesome. It’s a great product. I want my own. Read more about the latest Redarc Redvision developments here.